NEW Dell Wyse 5040 AiO ThinClient - 21.5 FHD. LCD - AMD G-T48E 1.40GHz - 2GB Ram - 8GB Flash - Webcam - WYSE Thin OS. Wyse 5040 AIO Thin Client. 21.5 inches (54.61 cm) Full HD 1920x1080 60 Hz Widescreen (16:9) flat panel display with Anti-glare with hard-coating 3H. AMD G-Series T48E Dual Core 1.4GHz. 8GB Flash, 2GB RAM DDR3. 4x USB 2.0 ports 1x RJ45 1x SFP fiber (optional) 1x VGA (PC mode) 1x DisplayPort (dual display) Composite audio jack: 1/8-inch mini, 16-bit stereo / Internal mono speaker HD web cam (integrated) Speaker bar (integrated) Microphone (integrated). Display with stand (W x D x H): 531mm (20.9 in) x 181mm (7.1 in) x 408mm (16.0 in) Display without stand (W x D x H): 531mm (20.9 in) x 45mm (1.8 in) x 343mm (13.5 in) Fixed Stand (W x D x H): 191mm (7.5 in) x 181 mm (7.1 in) x 315mm (12.4 in). Wyse 5040 AIO Thin Client - Stand - Power Adapter. 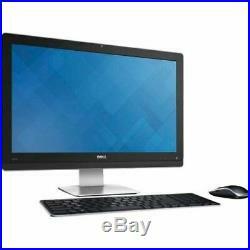 The item "NEW Dell Wyse 5040 AiO ThinClient 21.5 FHD LCD G-T48E 1.40GHz 2GB 8GB WYSE OS" is in sale since Tuesday, March 12, 2019. This item is in the category "Computers/Tablets & Networking\Desktops & All-In-Ones\PC Desktops & All-In-Ones". The seller is "laptopsforles" and is located in Oceanside, New York. This item can be shipped to United States, Canada, United Kingdom, China, Mexico, Germany, Japan, Brazil, France, Australia, Denmark, Romania, Slovakia, Bulgaria, Czech republic, Finland, Hungary, Latvia, Lithuania, Malta, Estonia, Greece, Portugal, Cyprus, Slovenia, Sweden, South Korea, Indonesia, Taiwan, South africa, Thailand, Belgium, Hong Kong, Ireland, Netherlands, Poland, Spain, Italy, Austria, Bahamas, Israel, New Zealand, Philippines, Singapore, Switzerland, Norway, Saudi arabia, Ukraine, United arab emirates, Qatar, Kuwait, Bahrain, Croatia, Malaysia, Chile, Colombia, Costa rica, Dominican republic, Panama, Trinidad and tobago, Guatemala, El salvador, Honduras, Jamaica, Antigua and barbuda, Aruba, Belize, Dominica, Grenada, Saint kitts and nevis, Saint lucia, Montserrat, Turks and caicos islands, Barbados, Bangladesh, Bermuda, Brunei darussalam, Bolivia, Ecuador, Egypt, French guiana, Guernsey, Gibraltar, Guadeloupe, Iceland, Jersey, Jordan, Cambodia, Cayman islands, Liechtenstein, Sri lanka, Luxembourg, Monaco, Macao, Martinique, Maldives, Nicaragua, Oman, Peru, Pakistan, Paraguay, Reunion, Viet nam, Uruguay.